Paul Delaroche was a painter whose realistic depictions of historical subjects made him one of the most successful academic artists of mid-19th-century France. Delaroche is reported to have said “From today, painting is dead” upon first seeing examples of the Dagurreotype process introduced in France in 1839 by its inventor, Louis Daguerre. The Sesquicentennial (150 years) of the birth of photography has now passed, and a corollary expression is emerging lately. I read “Film is dead” on many internet forum discussions of photography these days. It is expressed with a sense of sadness as if to mean that traditional photography itself is dead. “Film is dead” speaks to this modern photographic era just as “Painting is dead” resonated at the time Daguerreian photography first appeared in 1839. It may be a bit melodramatic, but the film-is-dead sentiment underscores a basic anxiety many classically trained photographers now have about photography in the digital age. Photography in the mid-19th century seemed to cast a shadow over the relevance of painting because it represented a paradigm shift in the human skills required to create amazingly detailed images. The extremely fine spatial detail captured by the Daguerreotype process is what fascinated the public most about the new process of “writing with light”. Henry Fox Talbot’s Callotype process appeared on the scene essentially at the same time as the Daguerreotype. A forerunner to the negative/positive photographic processes that later dominated photography for over a century, Fox Talbot’s salted paper print process lacked the image detail of the Daguerrotype. More painterly in appearance, the Callotype did not achieve the same commercial success as the Daguerreotype process. We take the accurate photographic recording of scene content for granted today, but it was a big deal at the beginning of photographic history. Although photographers have always been able to manipulate photos for purposes of deception or propaganda, generally speaking, photographs differ greatly from other forms of art and illustration for their ability to faithfully document and preserve detailed information about the world around us. My current research on color and tonal accuracy in photographic image reproduction serves to remind me of this fundamental virtue of photography. In my opinion, digital imaging is largely a byproduct of the electronic communications revolution facilitated by the personal computer and traceable to the invention of the silicon chip and the integrated circuit. Digital imaging is an overhaul of the methods of photography not the meaning of photography. The mechanical speed and ease of photography plus the fact that photography has many applications not requiring artistic expression has set it apart from other visual arts from its very inception. Nothing has changed in that respect. George Eastman expanded the fortune of the Eastman Kodak Company by capitalizing on the slogan “You push the button, we do the rest” long before photography actually became as push-button as it is today. The broad scope and history of photographic technology has always made it more difficult to convince skeptics of the merits of photography as an art form. The current situation with film-based photography is what is now on my mind. Film will remain, but it is fast becoming a select process for artists choosing to work with “alternative photographic processes” outside the mainstream. Film cameras may even see a revival in popularity as time goes by, but I’m OK with the reality that film is rapidly being abandoned by the typical consumer as well as the serious photographer. In my opinion, the highwater mark for film-based photography in the United States was the year 2003. Film availability, variety, and quality was at an all time high, and 2003 was the year that superstores like Walmart, Costco, and Kmart began to install digital mini labs in large numbers of their stores. These mini labs could accept film or digital files. 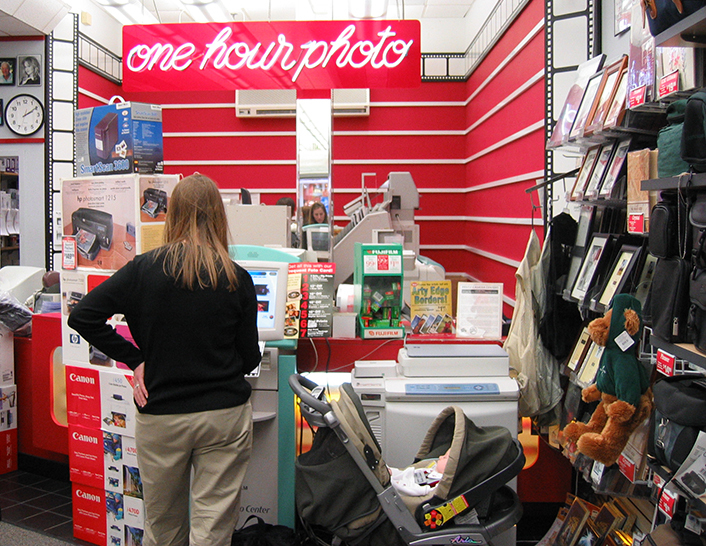 The consumer with a digital camera finally had an easy way to get “traditional” 4×6 photos printed using a familiar process at the one hour photo center. This market force was the tipping point for the the majority of consumers to move to digital photography. Photographers are now witnessing the rebirth of the home “darkroom” as affordable desktop photo printers become a welcome addition in many homes these days. Perhaps more revolutionary is the proliferation of flat panel display technologies and wireless networks that now beg the question – Is a photographic print really necessary at all? The photo industry has constantly evolved towards faster, better, cheaper. Printing is now optional in the digital age. Better isn’t always realized along with faster and cheaper. Throughout the film era it took a high degree of skill to coax the very best out of what the technology had to offer. Digital imaging is no different. Digital image quality at its highest levels requires more photographic knowledge and skill than ever. Human talent and creativity has not been taken out of the equation. It is needed as much as ever to separate the exceptional from the mundane. As for myself, I am not yet finished with film, and I will never be finished with printmaking no matter how many flat panel displays or 3-D projection devices grace the walls of my home. I grew up with traditional film and print media. I shot film for over 30 years before ever squeezing the shutter button on a digital camera. I still take pleasure in shooting film, but the opportunity presents itself less and less these days. I have a massive collection of images on film I want to print, and I now have color and tonal control over my images like never before. I also have a lot of pent up desire to return to my printmaking roots. That desire is going to be resolved at Aardenburg Imaging in the coming months as I ramp up the digital printmaking activities. What prompted me to speak of these matters? Well, yesterday at The Online Photographer website, I read a commentary by Peter Robinson, and he offers a free “film ribbon” to post as a sign of solidarity for those who still shoot film. It feels great to retain my film heritage, so I am taking Mr Robinson up on his offer to download his film ribbon image so that it may be placed on the website of anyone still shooting film. Yet the irony doesn’t escape me. The ribbon is an electronic image of a 35mm film strip, posted on the internet to download and share digitally, and lastly, printable on a digital desktop printer if indeed it gets printed at all. Not a square inch of film or single ounce of chemical developer is required in the entire transaction! Having said that, I still love film. Thanks, Peter Robinson, for your very cool film ribbon, and thanks, Mike Johnston, for giving us a great photographic information resource in the Online Photographer.